As we entered in the 21st century, we began recognising and visibly perceiving the impact of climate change worldwide. India remains an affected country. The phenomenon of climate change is grappling the world in various forms such as incidences of heat waves, cold waves, bursting of clouds, flash rain and floods and much more to count on. Some natural calamities like unpredictable rain, heavy rain are destroying crops and productions. The situation is affecting lives and economies. So adversely some communities are not able to cope up with the situations are getting into the deep sorrow of suicide, migration – due to loss of livelihood and turmoil in political and environment. The need of the hour is to make communities resilient and adaptive to face the challenges. For that communities need to adopt some bold strategies and facilitated in order to promote environmental sustainability. Climate change is one of the most noteworthy phenomena of the 21st century, which has gained a lot of attention in recent times. It has affected all dimensions of natural and managed ecosystems, from food and energy security to water environment. The relationship between water, agriculture and climate is a significant one. Moreover, this relationship is falling out of balance and jeopardising food and water security. The continuous rise in the temperature poses a significant impact on water resources. Therefore harnesses the potential for devastating effects on agriculture and food security leading to intensifying poverty. India is home to over one billion people and projected to increase to 1.7 billion by 2050. India is recognised as one of the most affected countries in the subcontinent from the climate change. Post-independence, the industrialisation and urbanisation have taken place rapidly which has impacted land use pattern adversely and created a huge increase in demand for water. India’s drinking water crisis has become severe over the past decade. Increasing demands on available water resources for intensive agricultural practices and industrial use, together with deteriorating water quality, constrain drinking water availability despite massive outlays for drinking water. The usage of the water has drastically changed throughout the country. Most of the farmers, industries, cities are relying on groundwater resources. 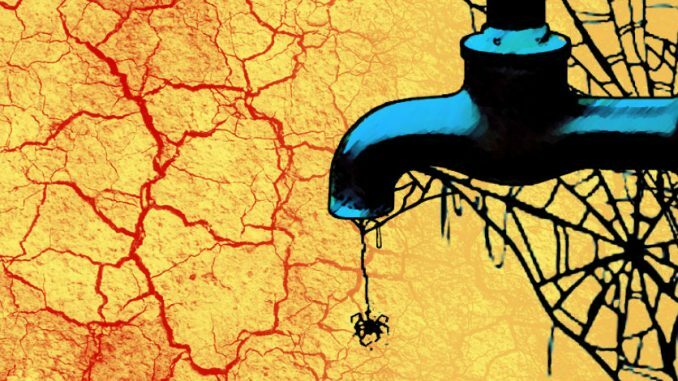 The exponential exploitation of groundwater has brought India at a stage where the entire country is experiencing depletion in groundwater.Rural areas are not the only part of the India who all are using the groundwater, however, in the urban areas, most of the houses have illegal submersible pumps. The river basins represent the main source of fresh water in the Indian subcontinent. India is endowed with a river system involving over twenty major rivers with many tributaries. A warmer climate will enhance the hydrological cycle, which implies higher rates of evaporation, and a greater proportion of liquid precipitation compared with solid precipitation; these physical mechanisms, associated with potential changes in precipitation amount and seasonality, will affect soil moisture, groundwater reserves and the frequency of floods or droughts. Doubled with unsustainable practices of water resources have come under increasing pressure and resulted in droughts. In addition to draughts in many regions, other areas also experience flash floods, heavy rains that become devastating, uncontrollable and have a huge socio-economic impact. There are also increased in incidences of the cloudburst. A recent example would be one that happened in Uttrakhand in 2008-9 which flashed away several communities and a resulted in the unaccounted death toll. Likewise, earthquakes are becoming the frequent phenomenon. The metros like Delhi, Mumbai, and Kolkata are more susceptible to such incidences and the costs incurred will be irreparable. Moreover, flash fires from some parts like West Bengal have been reported. In the year 1987 and 2002-2003, droughts affected more than half of India’s crop area that led to a huge fall in crop production and its value chain.In some areas like north-western India, Jharkhand, Orissa and Chhattisgarh the draughts have been experienced more frequently. Crop yields are expected to fall significantly because of extreme heat by the 2040s. More than 60 percent of India’s agriculture is rain-fed and dependent on groundwater. The groundwater exploitation is very high even without climate change; 15 per cent of India’s groundwater resources are overexploited. Although it is not easy to predict future groundwater levels, falling water levels can be expected to reduce further on account of increasing demand for water from a growing population, more affluent lifestyles, as well as from the services sector and industry. In the Yamuna, the level of groundwater has been depleting faster, increasing tension for water supply needs of over 20 million population and industries that are solely dependent on water from the Yamuna. India has experienced scorching heat waves since last few years, which have even caused several hundred deaths in states like Telangana, Andhra Pradesh and Orrisa. In addition, the weather pattern has been quite unpredictable in some parts of India like Rajasthan where farmers had heavy set back causing loss of crops, production and hundreds of lives. Changes in climatic conditions are affecting demand, supply and water quality. In regions that are currently sensitive to water stress (arid and semi-arid regions of India), any shortfall in water supply will enhance competition for water use for a wide range of economic, social and environmental applications. The growing population will heighten demand for irrigation and perhaps industrialization at the expense of drinking water. Disputes over water resources may well be a significant social consequence in an environment degraded by pollution and stressed by climate change. At the global level, India, particularly it’s coastal, arid and semi-arid zones are expected to be highly impacted by the climate change phenomenon. The world is optimistic about India as its policies and strategies towards mitigating the impact of climate change look promising. India needs to adopt strategies conducive to the local environment, which are adaptable by local communities and rethink its development priorities in view of the alarming situation of climate change. India needs to balance out its industrialisation, urbanisation and growth amidst severe poverty and climate change situation. Industrialisation being rapid and uncontrolled; India requires promoting more environmentally friendly and sustainable industries with less carbon emission that least environmental impact. At the part of urbanisation, India needs to focus on sustainable housing with technological measures sustaining infrastructure during events of earthquakes and fires. Since India would be prone to facing acute water problem, it requires promoting water conservation, soil and moisture conservation and watershed development. In addition, it requires promoting less water-intensive industries. Rainwater harvesting practices require much more emphasis and regulation on groundwater exploitation. In order to tackle unavoidable situations like the flood, fire or earthquake government needs to strengthen its disaster management programs and seek local solutions along with making communities resilient to adverse situations. Since poverty and lack of nutrition are another problems grappling a country like India where most of the population is poor, programs for nutritional security and food security needs to be promoted. Promoting sustainable industries, which may have the more positive environmental impact along with improved transportation, are necessary. Cycling can be promoted at the local level rather than motorbikes & cars, encouraging using public transportation would also have the positive impact on the environment. The corporations, small and medium industries may also adopt Work from home policy that will help to lessen travel so will contribute to the healthy environment. Micro measures like sustainable crop residual management, organic farming, and water conservation need to be greatly promoted to maximize the environmentally friendly practice. Finally, voluntary action needs to be promoted at every level and healthy lifestyle through sustainable consumption and proper management of solid-liquid waste and safe disposal should be encouraged in the urban context. If we are really the concern for our planet and wish a sustainable life for our generations yet to come to a strong resolve from each of us will help in turning the tide of climate change and ensuring food and water security the most crucial need to exist and sustain life.